Dr Kee:‘Orthopaedics surgery is growing due to the ageing population. PETALING JAYA: Apex Healthcare Bhd’s transformation into a healthcare group from a pharmaceutical-based company has put it on a stronger footing in terms of revenue and earnings. 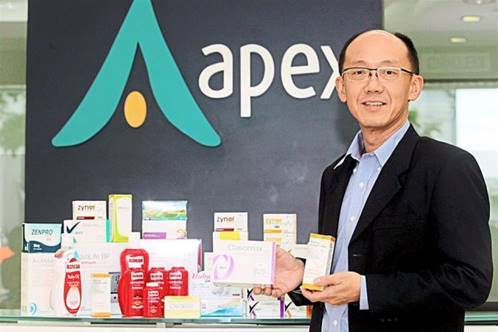 Chairman and chief executive officer Dr Kee Kirk Chin says Apex’s objective is to be an important regional player by growing the pharmaceutical, consumer products and orthopaedics business and increasing its exports. “Our main business is from pharmaceuticals, where generic drugs have been growing steadily, and also from the new products,” he tells StarBiz in an interview. In the financial year ended Dec 31, 2013, pharmaceuticals accounted for 80% of group revenue, he says. Total group revenue had risen 61.4% from RM259.24mil in FY2008 to RM418mil in FY13 while earnings doubled from RM14.77mil to RM30.02mil during the period. Dr Kee traces back Apex’s roots to pharmaceuticals when it started in 1962 as a retail pharmacy in Jalan Munshi Abdullah, then known as Newcombe Road, in Malacca. “This store is still operating today and serves to remind us of our heritage. While our core and foundational business is pharmaceuticals, there are many more closely related areas in the healthcare sphere that we can diversify into. “This creates new opportunities while reducing the risk of reliance on one key activity. We have today moved into direct-to-consumer healthcare products, diagnostics and most recently, the contract manufacturing of orthopaedic devices,” he says. In 2013, Apex re-positioned Apex Healthcare with a new logo to focus on a group of healthcare related businesses – pharmaceuticals, consumer healthcare products, diagnostics and orthopaedics. As healthcare has become more significant for Apex over the past five years, the latest move was its venture into contract manufacturing of orthopaedic devices. The venture in late 2013 was through its 40% owned ABio Orthopaedics Sdn Bhd in Penang which produces high quality, precision manufacturing orthopaedic parts for four of the world top 10 multinational companies (MNCs). The products, which are made from aluminium, cobalt chrome, stainless steel and titanium, would give Apex a foothold into the US$43bil global orthopaedics market. “Orthopaedics surgery is growing due to the ageing population. We contract manufacture parts for MNCs. The demand is from older people, trauma cases and young people injured in sports activities. A total of 99% of what we manufacture is exported,” he adds. For Apex, pharmaceuticals segment is the group’s main driver, followed by orthopaedics and consumer over-the-counter healthcare products, which includes Agnesia medicated powder and creams, to drive the growth in direct and consumer products. “For pharmaceutical business, demand is quite steady and firm, whatever the economic cycle. With higher per capita income, more income is spent to self-medicate, seek advice from pharmacists and buy over-the-counter consumer products,” he adds. The key markets for its pharmaceutical products are Hong Kong, Singapore and Indo China. Dr Kee says diversification has helped spread the reliance on any one key activity. For instance, in FY13, its revenue was affected by a 33% decline in the Malaysian government tenders, however, this was mitigated somewhat by sustained growth in exports. All the other segments in the group grew their business and this helped to offset the decline, he shares. In terms of manufacturing capability and capacity, he says every four to five years, it would increase to cater for increasing volumes and newer products. “We are looking at the next major upgrade for the manufacturing plant. This is in the planning stages and depends on future products that we have in our development pipeline. We are planning to kick off the project maybe next year. “The new facilities will be focused on the manufacturing of solid pharmaceutical products such as tablets and capsules for drugs which have come off patent.” However, Dr Kee says the capital expenditure (capex) had yet to be firmed up. For instance, its capex to upgrade the liquid plant in the Cheng industrial estate in Malacca in 2007 was RM26mil. In 2009 and 2010, it upgraded its solids plant for about RM5mil. While its receivables had increased to RM123.89mil at March 31, 2014 from RM101.32mil at end-2013, he said they were in line with the higher revenue due to the growth in business. Revenue increased to RM130.93mil from RM106.36mil. He says a strong balance sheet was a priority for the company. As at March 31, 2014, it had deposits, bank and cash balances of RM38.22mil, up from RM32.80mil at end-2013. “We do not have any plans to raise any capital as yet,” he notes. Currently, Apex is trading at a price-to-earnings of 14.81 times at the share price at RM4.80 compared with CCM Duopharma Biotech Bhd (11.90 times), Caring Pharmacy Group Bhd (19.91 times), Pharmaniaga Bhd (21 times) and Kotra Industries Bhd (23.03 times). He expects the one-for-four bonus issue, which will take effect on June 24, would increase the paid-up from 93.71 million shares to 117 million shares.